Levasseur's stunning decorative map of North America showing the ephemeral Republic of Texas. A visually stunning decorative map of North America dating to 1852, by French map publisher Victor Levasseur. 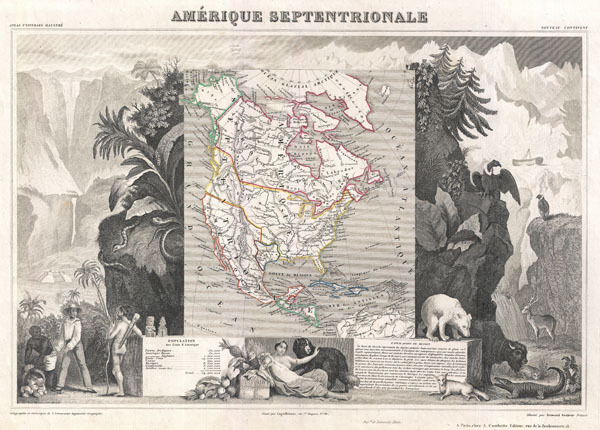 Levasseur published several different editions of his North America map - this being the most desirable due to its depictions of the ephemeral Republic of Texas. Though cartographically minimalist, there are a number of additional important elements that are worthy of note. These include the extension of Oregon territory well into British Columbia, reflecting the American claims that later led to the 54 40' dispute. Also, the Northwest Passage from Atlantic to Pacific is drawn as an open and practically navigable seaway. Rumsey 0427.096. Phillips (Atlases) 3003.